1 Preheat oven 200°C. Heat oil in a saucepan and brown chicken. 2 Add Pasta, milk and water, bring to the boil and simmer for 14 minutes. 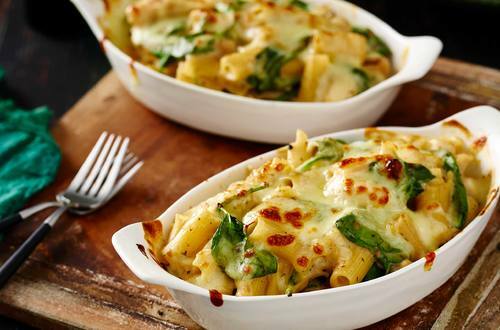 3 Stir through spinach, divide between 2 ovenproof baking dishes, sprinkle with cheese and bake for 10 minutes until golden brown.